Caption - Western Holdings Gold Mine, near Welkom. 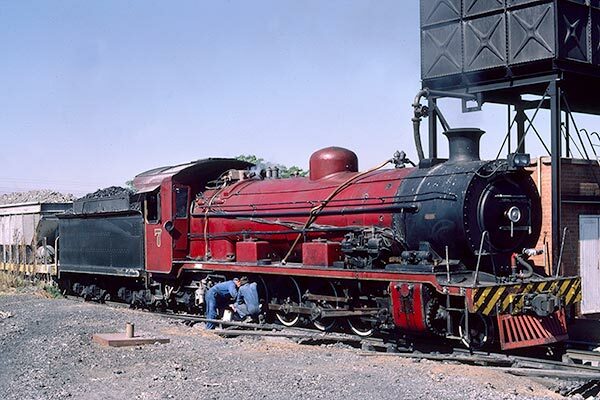 no.7 was an ex-SAR class 3BR 4-8-2 no.1482 and is seen in October 1980 receiving some attention. Like all the steam locos in this area, no.7 was kept in excellent condition. Built by North British in Glasgow in 1911 the class of 10 locos were originally used on the Natal main line and classified 3B class. Receiving standard boilers in the 1930s they became 3BR. On retirement in 1976 this loco was sold to Springbok Colliery in the Transvaal before going to Western Holdings. Sometime after this photo was taken it moved to Freestate Geduld as their no.8.